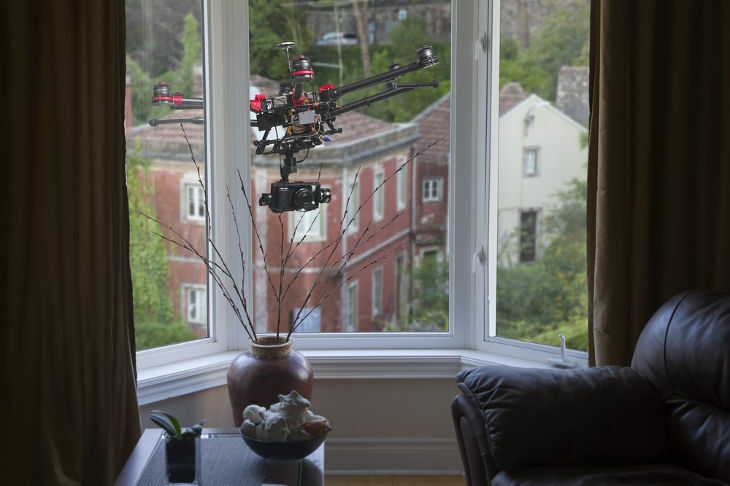 We’ve seen them in Homeland and Top Gear, but are we about to see estate agents piloting drones over our homes and streets? Obtaining aerial photography of a high-calibre property can serve as a badge of honour for an estate agency. However, acquiring these images has always been a challenging process. The cost of hiring a helicopter is often prohibitive, and platform-equipped cherry pickers are only available in tandem with specialist operators whose presence greatly increases per hour rates. Worse, helicopters and cherry pickers require advanced booking, which isn’t ideal for weather-dependent outdoor photography. The increasing affordability of drones was initially seen as an ideal solution to the aerial photography conundrum. Despite being no harder to control than a remote-controlled toy helicopter, these unmanned aerial vehicles (UAVs) can capture high-quality images within seconds of deployment. Cameras mounted on the drone body provide a wide variety of shooting angles, and they’re typically positioned on cushioned arms to prevent rotor vibrations blurring the images. Unfortunately, the UK’s legal system isn’t developing as quickly as the modern technology it’s supposed to cover. It’s well known that a legally-purchased Segway can’t currently be used on either roads or pavements – a paradox that renders ownership largely pointless. The same fate appears to have befallen UAVs at present; there is no regulation required to buy or own one, yet a legal minefield is lurking directly below that all-seeing camera. The first legal conundrum relates to invasion of privacy. If Farmer Giles sends up a drone to photograph an outbuilding, Farmer Palmer in the next field could claim that the resulting images display his land without his permission. No legal precedent has yet been established in the courts, and it would be incumbent on the pursuant to prove distress or loss of privacy. However, no estate agent would want to be involved in the defining court case in this area, especially considering the likely publicity. The second issue to be overcome with drone photography involves obtaining permission from those above, as well as below. The Civil Aviation Authority (CAA) has to grant permission for any drone used for ‘aerial work purposes’ to be flown in ‘any area of a city, town or settlement which is substantially used for residential, industrial, commercial or recreational purposes’. The same applies to any drone activity taking place ‘in proximity to people or property’. Unless a vendor lives in a Highland cottage within a huge plot, it’s likely that any UAV photography could be classified as meeting one of these broad-brush definitions. Permissions are often granted on a single-flight basis, with a six-page application form to complete and a £113 charge for working UAVs weighing less than 7kg. That’s a lot of paperwork and expense for an estate agent with several appointments per day in their diary. There is also a wider debate taking place about whether drone photography is even legal. The CAA themselves have described drone regulations as ‘evolving’, while EU officials are currently developing their first official policy on privacy and data protection regarding UAV recording equipment. There are issues with restricted airspace in parts of the UK, and insurance companies have been slow to introduce drone cover into corporate policies. Specialist UAV insurers have sprung up to fill this gap, but there appears to be no precedent for injury, damage or distress caused by a drone-related accident. Until the EU releases its keenly-awaited rulings on drone operations throughout Europe, or a test case defines whether UAVs can be held responsible for invading personal privacy, it seems UK estate agents should avoid the use of drone photography for now. By the end of this year, we should know more about whether those eyes in the sky can rise to the challenge of providing clients with affordable aerial property photography. LocalAgentFinder allows homeowners to request and compare agency pitches before instructing. On LocalAgentFinder.co.uk, agents can view live properties and pitch for listings in their local area. A pitch will include details of an agency’s selling/letting strategy, fees and history. LocalAgentFinder was founded in Melbourne, Australia in 2007 and has over 9,000 agents pitching for 32,000 listings annually.